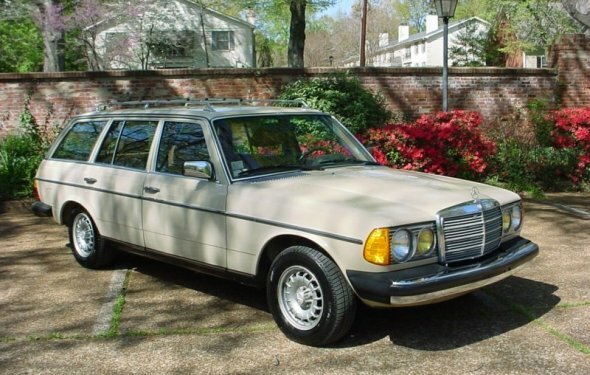 Sorry, the Benz has sold - 1982 Mercedes Benz 300 TD Station Wagon, 5 cylinder, turbo diesel. We are the third owners of this beautiful all original vehicle, which we purchased in 2000. This is a kilometer vehicle with 134, 000 kilometers (80, 000 miles). The original owner lived in Toronto, Canada. This was his 'third' vehicle and from what we know he used it only on his annual, extended vacations to Florida. Therefore most of the service on the car was performed in Florida. This car was seldom driven in Toronto, and it is as nice as the photos indicate. It looks and smells new. There are still original tags under the hood and on the windshield. This is the same body as the 1979, 1980, 1981, 1982, 1983, 1984, 1985 Mercedes Benz 300 TD Station Wagon. I believe that the Turbo Diesel was introduced midway through the 1981 model year. Prior to that it did not have a turbo. Bonnie and I had another 1982 300 TD that we drove to almost 240, 000 miles and loved that car. Unfortunately we drove it year 'round - so when we purchased this car in 2000, we decided to drive it just during the summer. We've only put a couple of thousand miles on it in 5 years and have just purchased a low mileage 1985 500 SEL, so we need to sell the wagon. If you were to put some miles on this car, you'd find that it would get 29-30 miles per gallon. The 1982 300 TD was $35, 000 new. They are currently valued at approximately $26, 000 in #1 condition. This is not a 'perfect' car, but it sure isn't far off. Asking $19, 700. Interesting offers / trades will be considered.